The Franconia Soaring Association (FSA) is New Hampshire's only soaring club. We are conveniently located at the Franconia, NH Airport just 2 hours North of Boston in the picturesque White Mountains of New Hampshire. FSA operates a well-maintained fleet of gliders, including a high performance 2-seat Grob Twin Astir. The club offers scenic rides, introduction to soaring flights, glider rentals, flight instruction, and glider towing. The airport is conveniently located just a few miles West of Franconia Notch State Park and Cannon Mountain ski area, and offers some of the best ridge and thermal soaring in the Northeast. Many times throughout the season, mountain wave soaring can also be experienced. The Mt. Washington wave is the strongest in the Northeast and flights of over 35,000 feet have been recorded there. On good soaring days, cross-country pilots routinely fly to Mt. Washington and Vermont. The club operates from mid May though late October, weather and field conditions permitting. Towing and introduction to soaring flights are available Saturday and Sunday, Fridays by special arrangement and on Mondays during holiday weekends. Soaring is a safe and exhilarating sport, and Franconia is a special place to enjoy flying over the mountain scenery. You will be surrounded by pristine nature and the majestic White Mountains. Occasionally, you may soar in the company of a Red Tail Hawk or Bald Eagle with views of Mount Washington in the background and wave to hikers on the summit of Mt. Lafayette as you fly silently over the Appalachian Trail. 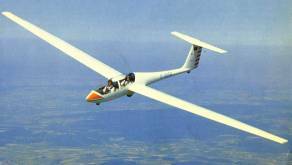 The Franconia Soaring Association is the only regular glider operation in New Hampshire. FSA is an all-volunteer club and as such members are expected to help out with ground operations when not flying. This typically involves staging, launching, and retrieving gliders, etc. Each member is required to manage the ground operation several days each season. Training on the ground operation will be provided to new members. Coming from out of town? Not a problem! There are accommodations to suit anyone’s desires, from family campgrounds and cozy B&Bs to vacation rentals and spectacular grand old hotels. Bring the whole family. Nearby activities include horseback riding, mountain biking, hiking, kayaking, canoeing, fishing, swimming, and exploring Franconia Notch State Park. For detailed information on the area, visit www.franconianotch.org. The historic and beautiful Franconia Inn is located at the airport and offers upscale accommodations, including breakfast and dinner, please visit www.franconiainn.com for more information.